The Telsmith 3244 Portable Plant provides the portable crushing producer consistent, reliable production, low mobilization costs and the flexibility in a number of processing applications such as producing quarried stone, sand and gravel, and recycling. 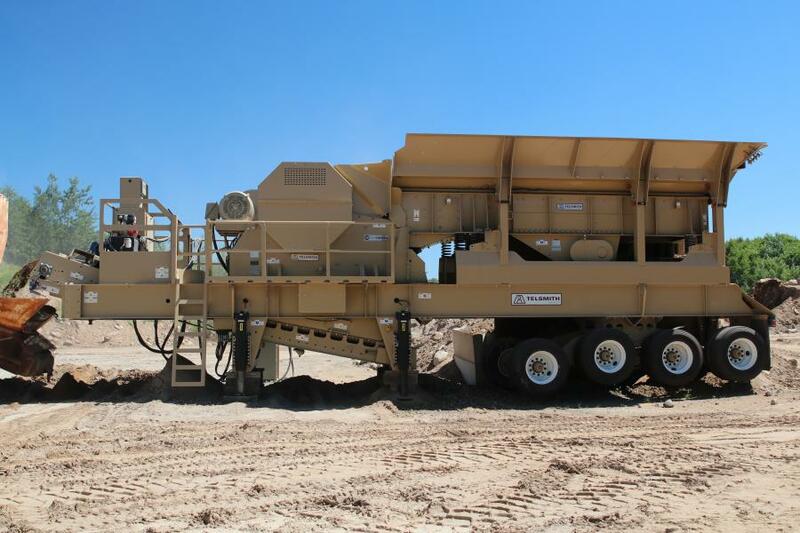 Telsmith Inc., manufacturer of mineral processing equipment, promoted its 3244 portable crushing plant at the 2019 AGG1 Expo in Indianapolis, Ind. The Telsmith 3244 portable plant provides the portable crushing producer consistent, reliable production, low mobilization costs and the flexibility in a number of processing applications such as producing quarried stone, sand and gravel, and recycling. The 3244 primary jaw plant can be used alone or configured with other mobile plants to create a complete processing system in aggregates processing. The 3244 unit begins with a 48-in. by 20-ft. vibrating grizzly feeder constructed with mild steel pan, 1/2-in. thick AR steel pan liners, 1/4-in. AR side liners, 6-ft. long straight deck AR steel grizzly bar sections and heavy-duty coil support springs with pads to support standard duty loader feeds. The vibrating grizzly feeder is powered by a premium electric motor that boasts an efficient 40 hp. In addition, the dual-shaft gear-driven vibrating unit offers adjustable counterweights, 140 mm flow through oil lubricated bearings, and grooved drive sheave to achieve maximum performance with minimal downtime. The 3244 offers throughput capacities from 175 to 265 stph through 325 to 530 stph and is part of the Telsmith line of Hydra-Jaw crushers. Hydra-Jaw crushers offer a toggle tensioning system which saves time and costs by eliminating the need to adjust springs when changing the setting. Quick to assemble and reliable in operation, the assembly requires no special tools or maintenance allowing for consistent reliable crushing. The core of the Telsmith hydraulic toggle system is the robust Hydra-Jaw hydraulic cylinder. Custom built specifically for the crushing environment, the cylinder incorporates a large piston for high crushing forces and an "oversized" rod for stability and strength. The unique bushing and seal are designed to hold up to the rigors of constant crushing in a dusty environment to deliver long service life with minimal maintenance. Telsmith engineers safety into every product. Following a power failure or emergency stop, Telsmith's hydraulic chamber clearing system allows the crusher to start up in as little as 15 minutes. Through push button controls, hydraulics crush any stone that remains in the chamber preventing oversized material from passing onto the product belt. Your workers stay safe, no digging out the crusher or clearing off the belt, and the plant starts back up as if nothing had happened, according to the manufacturer. In addition, robust platforms offer diamond plate walkways around crusher, 4-in. toe boards, 42-in. handrails and access ladder allowing provide a safe working space when performing maintenance, startup and mobilization tasks. Startup is made simple allowing for operations to begin crusher within hours. To achieve this, Telsmith designed three simple user-friendly control panels, soft start, motor start and off-plant. The soft start UL certified NEMA4 panel consists of a main circuit breaker for the crusher motor soft start. The motor starter UL certified NEMA4 panel provides a main circuit breaker, motor starters for plant motors and 4 extra 20 hp motor starters for off-plant conveyors. The off-plant panel support stand provides cord grips and 50 ft. wiring from starter panels to on-plant junction box. Telsmith's TRAC10 Automation feature comes standard on all portable plants. TRAC10 monitors crusher operations, provides automated calibration and setting controls and protects the crusher from overload; all to yield greater crushing performance and efficiency. Operators can initiate an automated calibration process via the touch screen monitor, that automatically "zero's-out" and resets to the proper setting. Operators also can modify the crusher setting at any time, even while crushing. Telsmith engineered and manufactured chassis provide ease of mobility and strength to handle the vibrations of many crushing applications. The 3244 chassis is built to last with 24- by 55-in. WF main beams, fifth wheel plate, equipment supports and cribbing legs that are easily adjusted for quick setup and mobilization. Telsmith offers chassis compliant with all 50 states on-highway regulations. The 3244 standard chassis includes quad axles and highway towing kit with 25,000 lb. axles, air brakes, walking beam axle support, (16) 11R22.5 tires, mud flaps and lights with reflectors. Total transport weight and dimensions for the standard configuration are 112,000 lbs. and 41ft. 2 in. by 10 ft. 7 in. by 13 ft. 5 in. For more information about Telsmith and portable crushers, call 262/242-6600 or visit www.telsmith.com.